(Photo: Reuters / Denis Balibouse)U.N. High Commissioner for Human Rights Navi Pillay (L) listens to Remigiusz Henczel, President of the Human Rights Council during the urgent debate on "the deteriorating situation of human rights in Syria Republic and the recent killings in Al Qusayr at the United Nations European headquarters in Geneva May 29, 2013. GENEVA - It was a cry verging on despair from the United Nations concerning Syria while a global Christian body used a similar vein of gloom to call for positive action by its flock to bring human freedoms to a region that is wallowing in destructive upheaval. 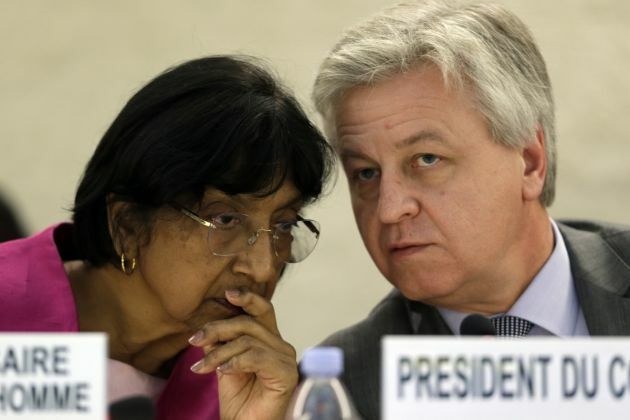 Navi Pillay the U.N. Human Rights Commissioner was empathic. "This Council should send a clear message to all parties to the conflict, and the external actors wittingly or unwittingly fuelling it: the conflict must cease, with an immediate cease-fire as a confidence-building measure leading up to the Geneva conference; the flow of arms must stop; and the process of national dialogue must begin now." The situation in Syria reflects a colossal failure to protect civilians said the UN human rights chief on the same day that the World Council of Churches urged Middle East Christians to fight for freedoms and the rule of law. Pillay said during a speech in Geneva, "Recent virulent instances of incitement to violence on grounds of religion or ethnicity, and the increasing involvement of a variety of extremist foreign fighters, are ominous signs of more violence to come." She noted, opening a special debate on Syria in the Human Rights Council, that day after day, children, women and men are suffer brutal and "unbridled violence and gross human rights violations by all parties." Further she noted that the increasing number of foreign fighters crossing Syria's borders to support different sides is further fueling sectarian violence, "and the situation is beginning to show worrying signs of destabilizing the region as a whole." The World Council of issued a statement Wednesday following its May 21 to 25 conference focused on the "Christian presence and witness in the Middle East" organized by the WCC and the Middle East Council of Churches in Beirut, Lebanon. The WCC statement acknowledged the deep-rooted history of Christian presence in the region, efforts for peace in the Israel Palestine conflict, political solutions towards conflict in Syria, and political stability in Egypt, Tunisia and Libya, calling the churches to act in unity to address challenges posed by unprecedented political, cultural and historical convulsions in the region. In this context, the statement called the churches to "continue to be being involved in the building of democratic civil societies, based on the rule of law, social justice and respect for human rights, including religious freedom." It said, "This is another time for such action, for a new vision of Christian cooperation in the region, for recommitment to Christian Muslim engagement, for engagement with Jewish partners also working for peace and justice, expressing our Christian vocations by working together to express mutual support and solidarity." "This is a time of crisis with special intensity here in the Middle East, but it affects all of humankind," said the statement released after the Beirut meeting which dealt with the situation in the whole region. "The elements of this crisis include an intensification of religious tribalism, increasing fundamentalism in many of the world's religions, dispersion of the influence of radicalized Islamist groups, widespread violence and insecurity, a deficit in democratic legitimacy and credibility, poverty and lack of opportunity, especially for women and youth, Christian emigration from the region, and a generalized sense of abandonment following decades of unhelpful intervention. Christians, Muslims and Jews all experience the destructive effects of these trends." In her speech, Pillay a former judge in South Africa and in the International Court of Justice said, "The flagrant disregard of international law is not limited to the Government side." The United Nations had received many reports of anti-government armed groups taking part in military operations in civilian-populated areas with some of them carrying out executions of captured members of pro-government forces and militias. " "The abduction of civilians by anti-Government armed groups, as well as killings, violence and threats of reprisals against civilian populations perceived to be supportive of the Government are also believed to be escalating," she said. The statement by the world churches group said the participants at the conference taking place during the Paschal season for the Orthodox participants and at Pentecost according to the Gregorian calendar, arrived hoping for news of the safe release of the two Archbishops from Aleppo. Boulos (Yazigi), Greek Orthodox Metropolitan of Aleppo and Alexandretta, and Mor Youhanna Gregorios (Ibrahim), Syriac Orthodox Metropolitan of Aleppo in Syria, were kidnapped more than one month ago. "The news of their kidnapping shocked the whole world, especially people of this region, and galvanized Christians around the world. "But they remain captives, as do hundreds of other kidnapped persons." The WCC said this was the situation faced by the people of Syria, and throughout the region. "We pray and hope that their speedy release, and assistance of the leaders of Muslim and Christian communities, will strengthen inter-religious co-operation."